Will normal people/users ever see near 100ms pings to North America? Forums › Spark New Zealand › Will normal people/users ever see near 100ms pings to North America? For the most part as a residential customer with Telecom, I would give them a 8 or 9 out of 10 for internet service. And as a customer I certainly look forward to the day the internet box down the road gets upgraded giving us more speed (sometime later this year we hope). But the one thing that is more important to me and any other online gamer is ping. With the majority of game servers being in North America...i'd really like to know if there is ever going to be the day ---- i'll enjoy a good ping to NA of say around 100-150ms? I am sure no one likes to read this (other than Telecom)--- But I would pay $50 more (maybe more) a month for a good ping to NA (packets prioritized customer? I don't how they can or if they can do this). There has to be a lot of gamers (in the thousands? or more?) 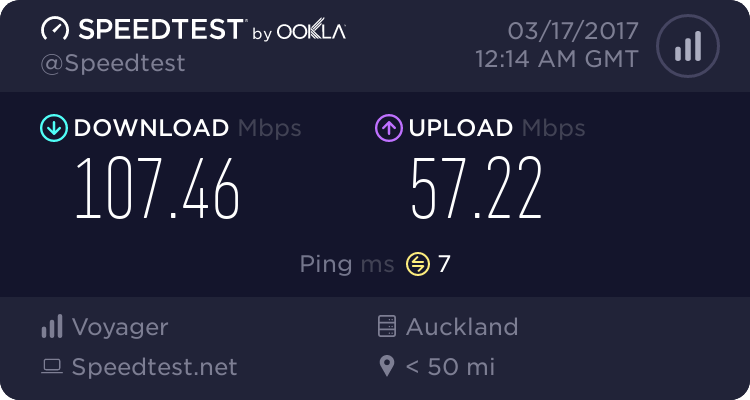 in NZ that would be pay to have a lower ping to NA. If you can change the laws of physics it's entirely possible! Well I know some guys I game with (also in NZ) are claiming pings around 180ms (down in Dunedin) and I though KDC was getting 90ms pings to NA (I know his was expensive option, but still he was getting 90ms). On any given night - If I connect to US with my VPN I can get a steady ping of 240ms. Yet if I switch my normal Telecom route to US, I get pings of 280ms or 300ms. Seems a few people in NZ are defying the "Laws of Physic's", eh? Azzura: Seems a few people in NZ are defying the "Laws of Physic's", eh? It takes the light around 35ms to travel between Auckland and Los Angeles. Round trip is 70ms. 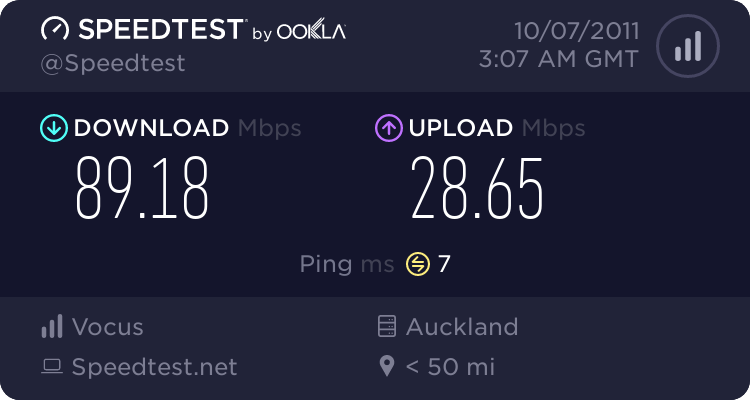 Add to this from your home to the ISP, then from Los Angeles to whatever place the server you want to reach is located, then take in consideration the server load and pretty much you won't get less than 100ms to USA from New Zealand. Do you have a particular IP in mind interested users can ping and report? It must be longer than 70ms RTT surely? To LA I get 155ms minimum. freitasm: It takes the light around 35ms to travel between Auckland and Los Angeles. Round trip is 70ms. There's an interesting article written by Stuart Cheshire many years ago regarding network latency. The very great majority of it is still very applicable today, and worth a read. For those of you playing Bolo about 20 years ago on a Mac Classic or BBC, he's the guy who wrote that. I guess I made an error on the ping Kim had. It wasn't 90ms as I initially though, it was 3 times better even - at 30ms (according to articles i've read on the internet). Perhaps there is an error in this reporting...as the view here is - this doesn't seem to be possible. I can certainly understand that a 30ms ping is a pipe dream. But you will have to forgive my ignorance in hoping for something in the 100ms to 150 ms range ... perhaps a possibility (I don't know). Some will argue cost...but if there are thousands or perhaps even 10's of thousands who might be willing to pay (w/e extra a month) for better routing and or prioritized packs to NA. That adds up to a hunk of cash per month/yr for whatever ISP can manage to pull it off. Games have been defying the recession by sales actually increasing. A lot of people game on the internet, games and online gaming go hand in hand. I know if an ISP can backup a better ping for gaming to NA (it'll be please take my money! NOW!). Perhaps I am wrong, but is it a potently revenue maker they want to ignore? Truly--- an avenue that hasn't been taken? We have speed, we have larger data caps. What else might customers be willing to pay for...a better ping? Right now..i'd probably give my left nut for a 150ms ping to LA! 30ms defies the laws of physics, it just cannot happen over any medium that travels at a speed that is in order of the speed of light. 150ms is doable in theory, however, the suggestion that signing up thousands of people for a service that provides it would be counter-productive. The more people signed up, the more packets you are going to have queuing, and the higher the latency will get. The actual bandwidth used by most games is fairly small. Does this not mean less packets? If it was game traffic on the fast routes only maybe it would be doable. Since any ISP theoretically has the capability to optimise particular routes it would be mostly a marketing thing or a specialist isp's promise or guarantee that they would purchase appropriately to optimise the desired routes for a particular level of service. The propagation speed in fibre is approx 5uSec/km, following the link below real transit times to the West Coast for Southern Cross alone is around 60-70mS+ depending on which route you go and where you exit. Unless you have some method of changing the speed of light or the propagation characteristics of the fibre, or maybe moving either NZ or the US closer together I suspect you out of luck! That article is pretty light on technical details, like from what point to what point has gone from 30 - 150ms. It may be the link from the mansion to the Sky Tower itself. Perhaps he got a radio link because DSL wasn't available (Coatsville is semi-rural). Maybe he could get DSL, but it was a long way from the exchange, so not enough bandwidth to Skype or something? I used to play WoW with a tunnelling service and would get in the range of 155-165ms to LA from Dunedin. I have never seen my ping lower than that to a US server.